We provide Vocational Evaluation, Loss of Earning Capacity Analysis, Future Medical Cost Projections, Labor Market Analysis and Economic Projections to present day value for Personal Injury, Workers Compensation, Veterans Administration, and Social Security Disability cases. Clifford Vocational Services regularly provides support and testimony in litigated cases in the United States. Do you need help with a veterans disability claim? A vocational assessment can help with your initial claim or when your claim has been denied. Do you or a client have a Social Security Disability claim that you need to strengthen or has been denied? We can help by providing vocational assessment and other services to help your case. Many people are denied after going through the claim application and filing for a Long Term Disability or personal injury insurance claim. Often you need to bolster your or your client’s claim with more evidence. We can help with Vocational Assessment services. 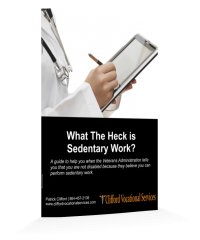 Veterans: Has The VA Told You Can Do Sedentary Work And Denying You Benefits? I was extremely satisfied with Clifford Vocational Services, they conducted a thorough and complete analysis, and provided an expert opinion that clearly demonstrates their knowledge and attention to detail. Pat is great to work with. He is timely, professional, and takes care to consider and address the nuances of each case. Patrick Clifford has worked on several of my cases, all with excellent results. I highly recommend his work. Pat is always there to help when needed! He does his job quickly and thoroughly. When we are in a pinch and need results we know we can count on Pat!